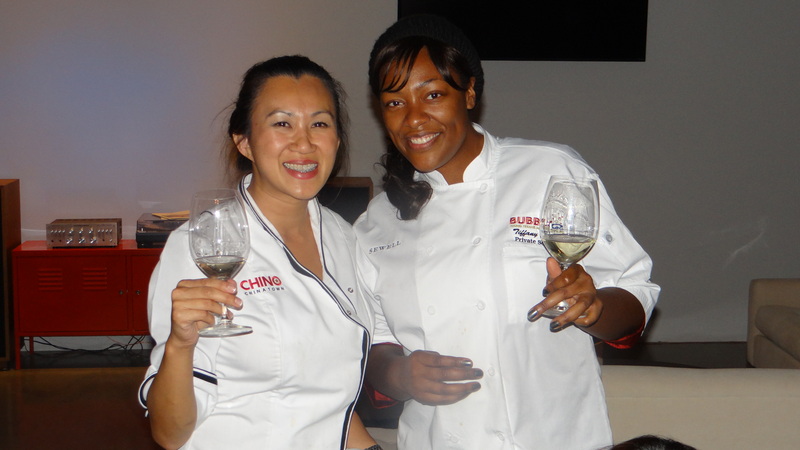 Last evening chefs Tiffany Derry and Uno Immanivong took to the kitchen at the Wine Poste, located just to the edge of the Design District in Dallas, and created a fantastic meal with an Asian theme. Derry is no stranger to Asian cuisine, in fact it is her personal preference when dining. The same can be said for Uno as well. Last night they both told me separately that they are fast friends, having just met a few months ago. It was Derry who said that hey were “sisters from another mother”. So it made perfect sense to see the two in the same kitchen, working in unison to create this marvelous meal. You know Derry from her work on Top Chef, but more recently is a regular on Spike TV’s Bar Rescue, and Hungry Investors. She also made an appearance on the Food Network’s Cut Throat Kitchen, but is tight lipped about the outcome of that program. Uno made her cheffy splash on ABC’s The Taste and will soon open Chino Chinatown, a Latin/Asian fusion concept that will open mid November 2013. You can also catch Uno on craveRADIO each Sunday where she is co-host. The dinner last night was spectacular, as you might expect from the pair of chefs. The wine was also brilliantly paired for the evening by the folks at The Wine Poste. This group is committed to bring in regional and nationally regarded chefs into their very unique space that is as much an event space as it is a wine shop. Check out what you missed, and be looking for another pop-up dinner from these two talented women very soon. 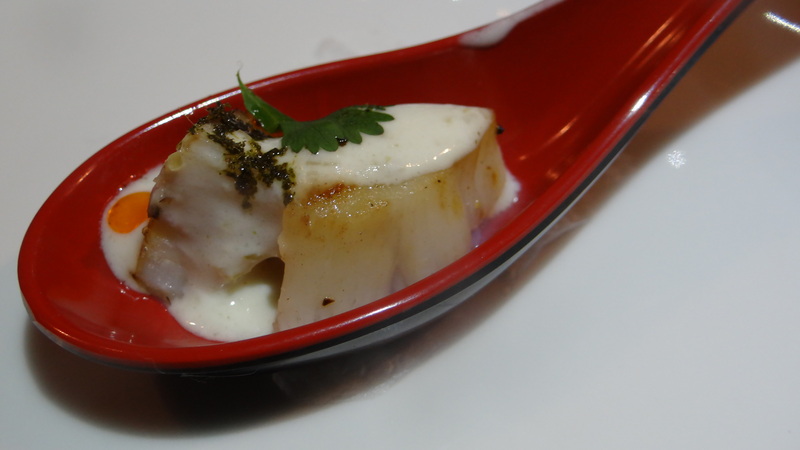 The amuse-gueule was this flavorful spoon made up of a bay scallop, coconut, lemongrass and toasted garlic. The spoon was almost too pretty to eat, and was the perfect bite. The wine was a 2009 Domaine Carneros Brut. This warm beet salad was finished by frying the beet for a crispy outer texture, set off by the yuzu mayo and dashed with bonito and nori strips. The pairing was a 2011 Mt Beautiful Pinot Gris from New Zealand. This bowl of “pho-zole” is Uo’s signature dish that she will be offering at her restaurant later this winter. It is a three day process to make the bone marrow broth, and made “Chino-style” with the addition of the Latin components such as the braised oxtail and hominy. I noticed something new to this bowl and that is the orange dollop on top of the oxtail. This is a flavor booster that Uno makes and is marrow butter with kicked up spices. It is meant to be swirled into the broth, and something perfect for those who love to play with their food. Pho is a very hands on dish, so this makes sense and was paired with a 2012 Clo Du Val Sauvignon Blanc from Napa. 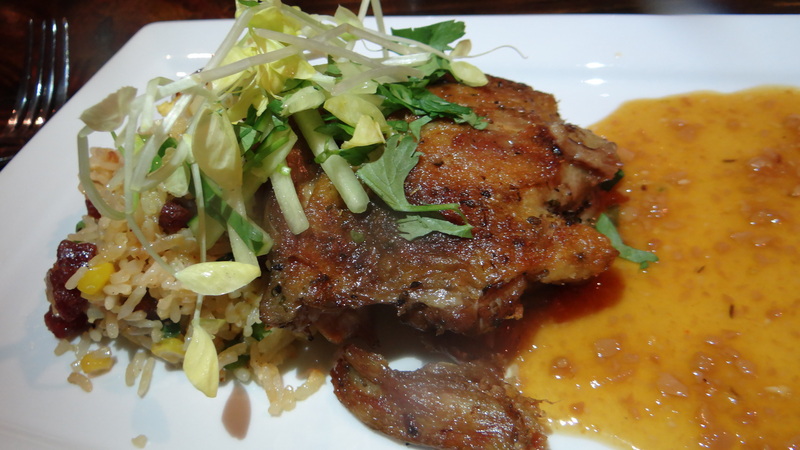 To ensure no one walked away hungry, this platter of duck fat fried rice was sent out with a garnish of a very large slab of crispy duck confit. The rice was also laden with bits of Chinese BBQ pork and sausage, which actually looked like lardon. It had a similar flavor profile, but with a light sweetness from the sausage. The accompanied sauce was made of ginger and cucumber. The pairing was a 2008 Neyen Espirtu de Apalta from Chile. 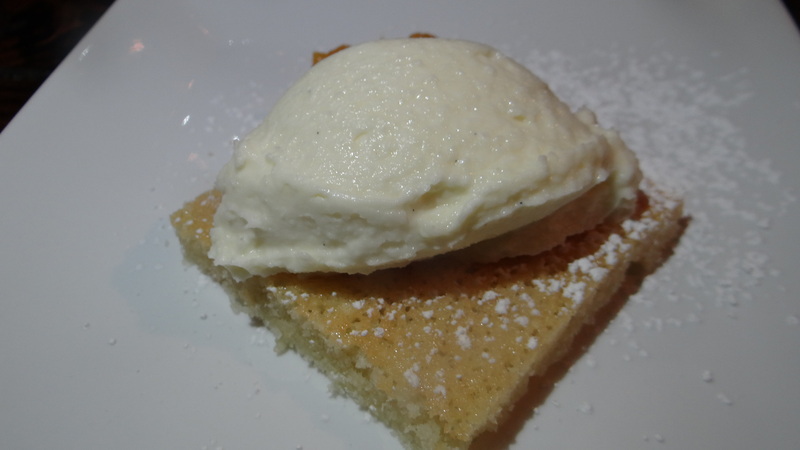 The ladies finished the meal by sending out an almond cake with orange marmalade and a marscapone cream. This was paired with a 2007 Fonseca Port.